What was once an unbroken expanse of wetlands and fishponds between the mouths of Waiehu and 'Iao Streams at Ka`ehu Bay in Maui is now mostly developed, with few places for the community to access the shoreline. In May 2012, The Trust for Public Land helped protect 64 acres of coastal wetlands at Ka`ehu Bay, which includes Hawaiian cultural sites including habitation structures, agricultural terraces, former fishponds, and shrines. The wetlands also provide habitat that would attract endangered Hawaiian waterbirds such as the ae'o (Hawaiian stilt), 'alae ke'oke'o (Hawaiian coot), and koloa maoli (Hawaiian duck). 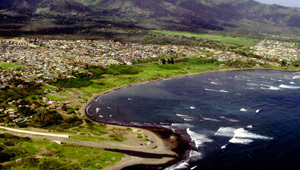 It is also a popular area for surfing and fishing. Local community organizations, including Kauahea, Inc. and the Neighborhood Place of Wailuku, are working with local Hawaiian Homestead communities, neighbors, and stakeholders to help the County of Maui restore and steward the land. Volunteers hope to restore the springs, remove invasive species, construct a native plant greenhouse, and replant taro.